Energy efficiency not only affects your bottom line, but it also increases comfort while sending a message that you care about the environment. If you’re looking for ways to save energy, here are a few of the top tips for 2015. The biggest way to save on heating and cooling costs is to install an up-to-date HVAC system. Choose systems with high energy-efficiency ratios and make sure that your contractor installs them according to “Manual N” calculations, so that you know your system is sized correctly for your building’s heating and cooling needs. Replace old motors with new, high-efficiency motors. Replace inefficient chillers with chillers that operate less than .60 kilowatts per ton. Variable speed drives help reduce loads — and thus energy use — on overburdened motors. Consider side-economizers to reduce cooling costs in the spring and fall. Even without new or replacement parts, you can still improve your system’s performance with a preventive maintenance plan. Each month, make sure that filters are cleaned or replaced. Clean evaporators, condensers, coils and heat exchangers regularly. 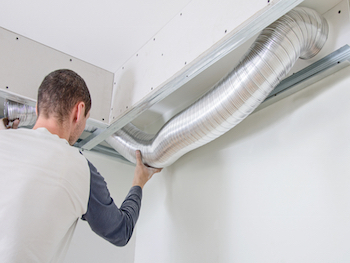 Repair leaky ducts and make sure that ducting is properly insulated. Open curtains or blinds in the winter to let the sun warm the office and close them in the summer to keep the heat out. In the winter, lower the thermostat by a few degrees when everyone leaves for the day. In the summer, do the reverse — raise the temperature once everyone leaves. This can cut as much as 10 percent of your heating and cooling costs. Warm air rises, which means you can use fans not only to circulate air in the summer, but also to move heat away from the ceiling in the winter. Consider replacing older light fixtures with new fixtures that emit the same amount of light using fewer bulbs. 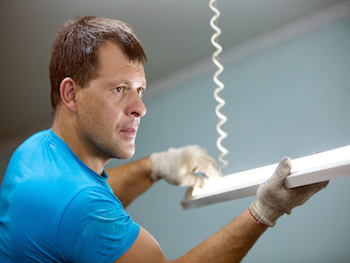 Upgrade to newer lighting technologies like compact fluorescent and LED. This includes not only overhead or desk lighting but also things like “EXIT” signs. Rely on sunlight wherever possible. In rooms with lots of natural lighting, use dimmer switches to dim the overhead lights or shut them off completely. Use motion sensors to automatically switch lights off and on — particularly in places like conference rooms, supply closets or bathrooms. This ensures that the lights are turned off when the room isn’t in use. Don’t rely on screen savers when monitors aren’t in use. Screen savers don’t save any power, which means your best bet to save energy and prolong the monitor’s life is to simply shut it off. By turning off equipment during off-hours — computers, printers, copiers, etc. — you can save in two ways: First, you’ll use less energy, and secondly, you’ll reduce the amount of heat the equipment generates, which makes it easier to cool the building. Most electronics draw power even when they’re turned off. Use power strips or plug load controllers to make sure that equipment isn’t drawing power when it’s not in use. Make the switch to laptops instead of desktops. Laptops are designed to use 80-to-90-percent less power than desktops. If you want to apply some of these tips — particularly those dealing with office equipment and lighting — then it doesn’t hurt to get your employees involved. Implement a few of these tips, build a strong energy management policy, and encourage your workforce to be energy conscious. You’ll find that even a few small changes could save your business hundreds or thousands of dollars per month on energy costs.